Loews Chicago is one of those unique properties in the downtown area that not only offers superb service and luxury, but an enviable location allowing visitors easy walking access to most of the city’s landmarks. The stylish lobby, spacious rooms, inviting rooftop patio, and family friendly amenities all make the Loews Chicago a stellar property indeed. Families looking for a welcoming hotel in the heart of the action need look no further than Loews Chicago. 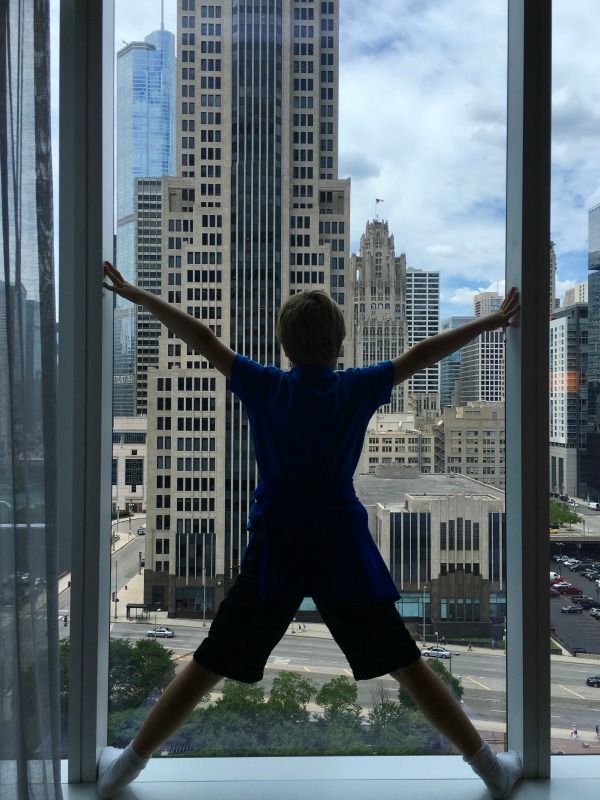 My youngest son and I were recently guests of Loews Chicago and were excited to have a mini staycation. We were asked to review the hotel’s “Urban Explorer Family Package.” This family scavenger hunt through the city teaches locals and visitors alike about some of its famous landmarks. The hotel provides children with their own backpack and journal, as well as other supplies to make their adventure a memorable one. 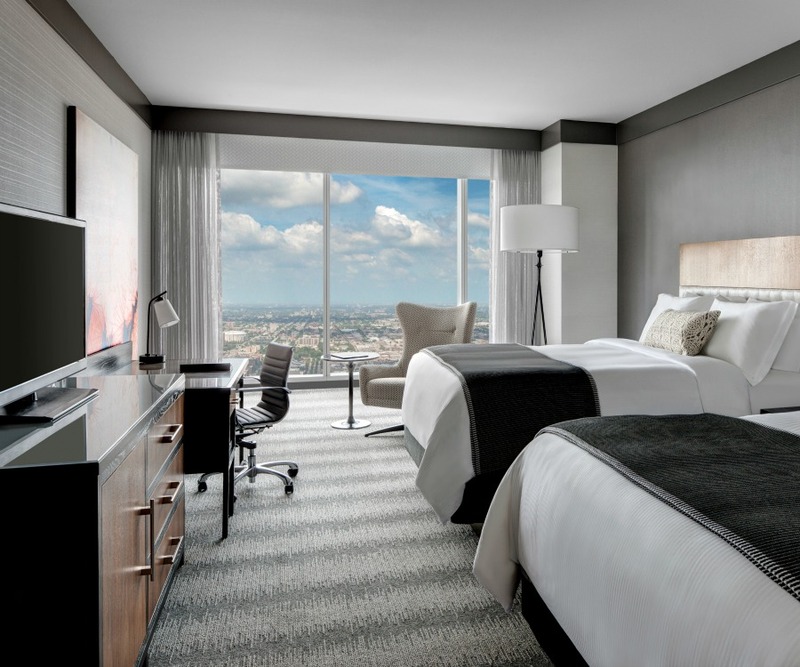 If you want a location in the heart of the city, Loews Chicago is the perfect choice. Within walking distance to Michigan Avenue, the Chicago River, Navy Pier, and Millennium Park, the hotel is also near the John Hancock Observatory, Water Tower, and Art Institute. Directly across the street is a movie theater and a bowling alley, and there are several restaurants to choose from as well. As I mentioned, we were able to try the “Urban Explorer” package during our visit. Upon arrival, my son received an “Explorer Kit” filled with everything he needed for our urban adventures. Inside the explorer backpack we found a water bottle, sunglasses, a compass, a scavenger hunt clue book, a journal, and colored pens. (After kids complete the scavenger hunt by finding the local attractions, they return to the front desk to show their results and receive an additional prize). The package also came with a stuffed cow, which my son promptly named “Cowlvin.” (Milk and cookies were delivered at a later time and breakfast was included for my son as part of the package as well.) 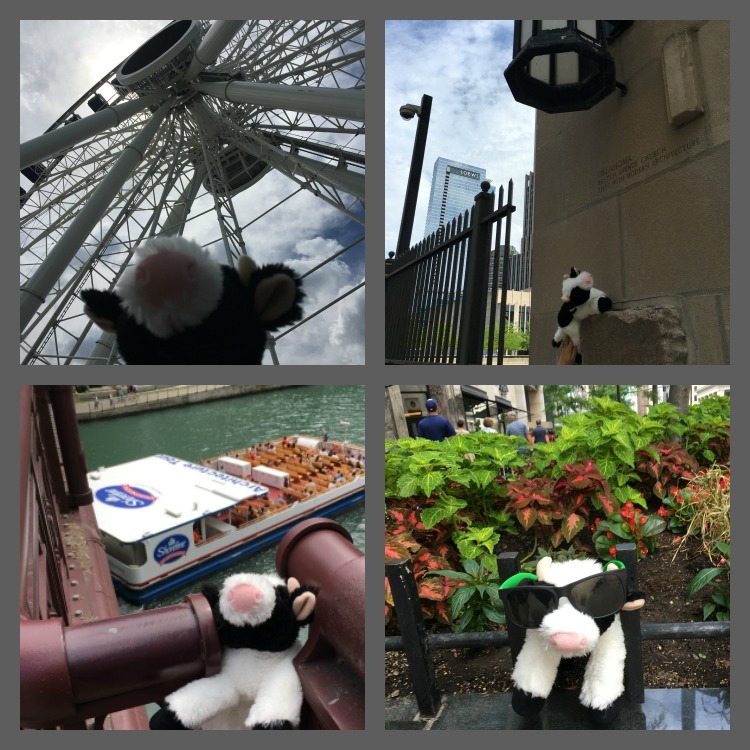 My nine year old was extremely excited to see the city with his newfound friend and we definitely covered the sights as only a boy and his cow can do. Something unique to this property is its rooftop patio, Streeterville Social. The rooftop has a ton of seating space, an area for lawn games, and a bar. The view of the city is spectacular from this vantage point. My son loved beating me in several games of corn hole, and we enjoyed watching other guests play a game of giant Jenga. As the evening progresses, the atmosphere becomes more suitable for an older crowd, but families will enjoy spending the early evening hours outdoors overlooking the city. My son might not play this game as intended. 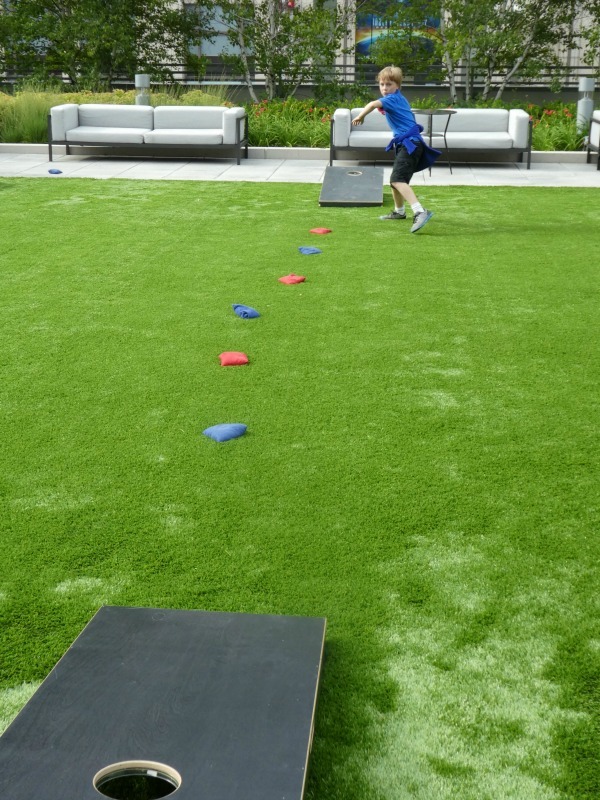 Loews Chicago has Loews Loves Kids programs that are designed to make it fun and easy for traveling families. They offer plenty of items to help make stays easier. A “Kids Closet,” offering items available for guests to use during their stay. 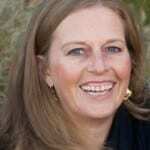 These include toys, books, strollers, night lights, and iPads loaded with age-appropriate games. The rooms are extremely large. Even with two double beds, we had more than enough room to spread out. The view from our room was fabulous and every time I opened the curtains it took my breath away. We were on the top floor of the building and had a view of the Chicago River and Michigan Avenue. If we had traveled as our typical family of five, we could have stayed in this room with a roll away (it would have been slightly cramped) or chosen to have two adjoining rooms (and two bathrooms, so that would be helpful). I always love having options when traveling. I think he liked the view! My son said the staff was super friendly and I couldn’t agree more. Every person we met from the front desk to the waitstaff at the restaurant to the doorman was extremely helpful and pleasant. They made my son feel extra special as he showed off the selfies he had taken on the “Urban Explorer” scavenger hunt and gushed as he explained our downtown adventures. Not only did they win over my son, they won me over as well. It’s a great thing Loews Chicago has a pool because many properties downtown do not. However, it is a lap pool and is shallow on both ends and deep in the middle. This is typical of most hotel pools in downtown Chicago. The pool is certainly functional and I have yet to meet a child who complains about a pool, but the depth could be an issue for small children. 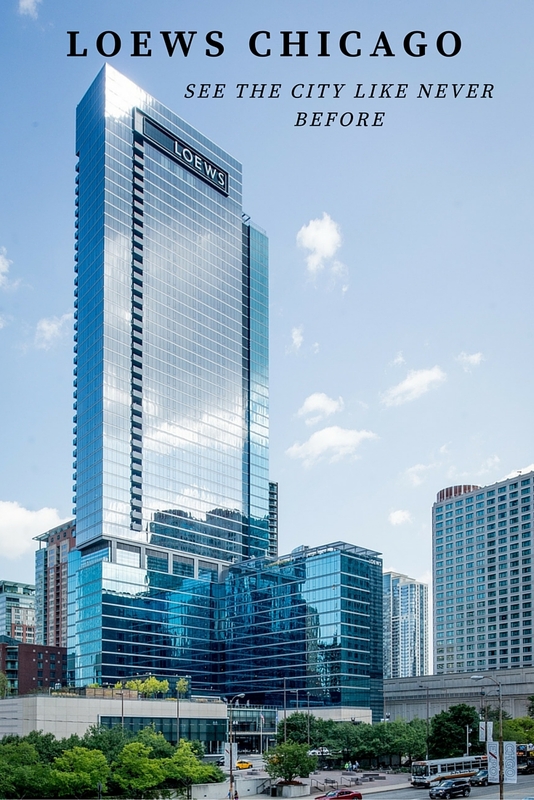 Loews Chicago was completed in March 2015 and is a stunning addition to the Chicago skyline. Located on Park Avenue, the property is just off Illinois and walking distance to Michigan Avenue, the Chicago River, and Navy Pier. The hotel has 400 luxury guest rooms (including 25 suites), meeting space, and three on-site restaurants with a variety of food options. The hotel features complimentary wi-fi, a 24 hour fitness center, a business center, and valet or self parking. The rooms are very spacious. Even with two double beds, a desk, and a chair we still had ample room to spread out. There is a flat screen TV, coffee maker, mini fridge, and very large bathroom. The rainfall shower head had great water pressure and the sink had plenty of room for toiletries. The bed was one of the most comfortable I’ve found in a while, and I loved having a variety of pillow options. Even though there were two beds, of course I had to share one with my son. There was a window that spanned the length of the the room overlooking the city, the rooftop restaurant, and out to the river. There was no street noise which was amazing considering we were in the heart of downtown. We slept very well that night. 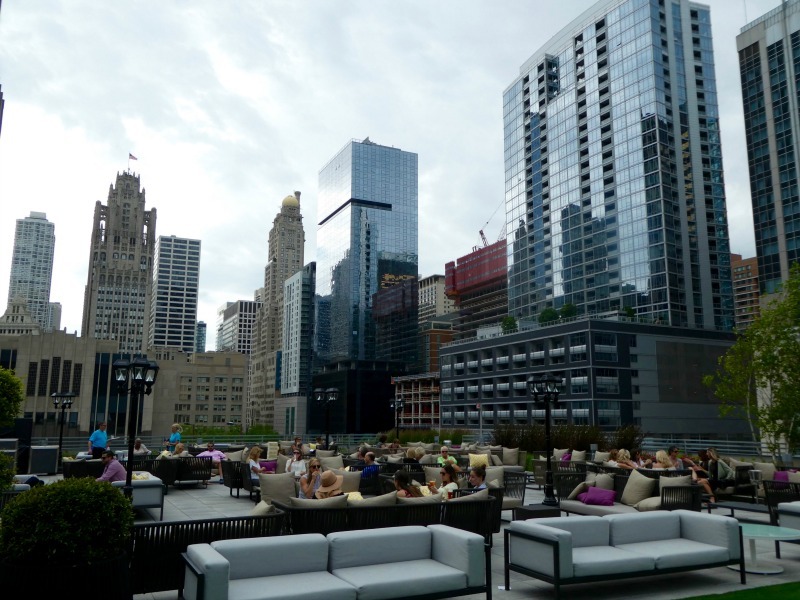 The rooftop terrace, Streeterville Social, is open seasonally from June through September. It is the the city’s largest outdoor rooftop terrace (over 9,000 square feet) and there are two separate areas for dining, The Bistro and The Terrace. The Bistro is sit down dining and The Terrace is more for cocktails and small bites (they make kiddie cocktails or regular drinks too). The Terrace is where families can go to play games in the early evening hours. Rural Society is the main restaurant on the property. It serves breakfast on the weekends and is an Argentinian steakhouse at night. The evening menu consists of pizza and pasta, small plates, and of course steak and seafood! We enjoyed breakfast (which was delicious), but did not eat dinner. The menu looks reasonably priced with many offerings for families. ETA is the bar/restaurant in the lobby area. They serve breakfast (during the week) and lunch as well as cocktails in the evening. It is a very welcoming space where families can feel comfortable dining. Starbucks also has a full service café on site. So if you don’t have time for a sit down meal, you can grab a snack and coffee to go. Of course there’s always room service too! Loews Chicago was everything I look for in a downtown property. Comfortable and convenient with a wonderful staff and amenities, Loews had it all. The “Urban Explorer” program was a hit with my son and I am sure it will be a draw for many future young travelers! Want to see inside a room? Check out my video!